Tour dates: 15-27 August 2004. Total distance: 1500 km. 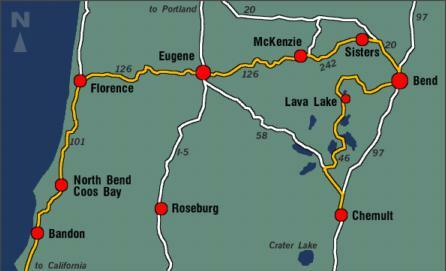 The Map shows the northern Oregon section only; after Bandon the road simply follows the coast. The Amtrak train that was supposed to take me to Chemult only went to Sacramento because of a tunnel fire. Although they left us sitting in the bus for two hours, the bus still got us to Chemult hours before the scheduled train would have. Passenger rail travel in the US is more of an afterthought, but everybody did their best to get us to our destinations. From Chemult I used Highway 97, then 58, then 46; progressively smaller roads with progressively less traffic. Most of the traffic is huge trucks, and humongous RVs pulling SUVs that look like toys in comparison. (An RV is a ``recreational vehicle'', usually a giant bus with a driver not necessarily aware of the size and width.) Shoulders are adequate, and almost all drivers are very courteous to cyclists. 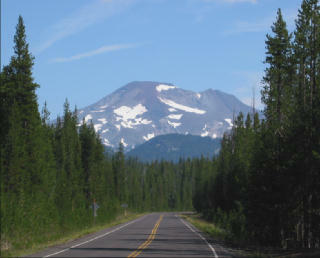 The scenery is impressive - most of the road leads through the Deschutes national forest, with the smell of cedar in the air. (Very high-tech place it seems, they name their forests and rivers after Intel processor and chipset project names :-) Glimpses of the lakes I have been passing are rare, and when I took small detours like at the North Davies campground, the lake looked more like a river cutting through a marsh. The terrain is hilly, as one would expect in the Cascade Mountains, with numerous climbs, but none gains more than 100m so it's quite manageable. Although August is still considered high season, campgrounds are mostly completely empty. Campgrounds here are designed for RVs exclusively, and have RV hookups but no amenities beside a pit toilet and a well with a hand pump that dispenses wonderful cold water to fill my bottles. Well water is safe to drink; river or lake water is not. I normally want a hot shower in the morning and evening, so I got more and more desperate checking out one primitive campsite after another, until some friendly campers told me that the Lava Lake resort campground has showers and groceries. Although it's a RV campground, I highly recommend it - the sites are large and secluded, and the showers are great. Also, it has the first grocery store, or in fact any store, I have passed since Chemult. I am writing this sitting on the campground's boat pier, looking at the sun setting over the mountains all around me. I didn't intend to ride over 100km through the hills on my first day after losing a night's sleep, but the campground was well worth the extra effort. The next morning started with a long climb, in several stages, around Bachelor mountain. Total altitude gained was about 400m. The views along the route were among the best of this trip - lots of forests, views over mountains and lakes, and occasionally lava fields. 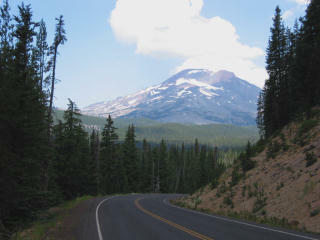 Near the summit, the road merges with a wide four-lane road that is much less scenic. It took me mostly downhill to Bend. Bend is a town of 55000 with grocery stores, restaurants, and motels, but is otherwise not especially interesting for the passing tourist (I am told you'll find great mountain biking, climbing, rafting, hiking, and breweries here). I had to get back on Highway 97 for a few km, until Highway 20 splits off to the right. A few km after the split is a large modern tourist info building on the left side, where I got directions to the Cold Springs Resort. (Or so I thought.) They have plenty of travel brochures, a water fountain, and restrooms. 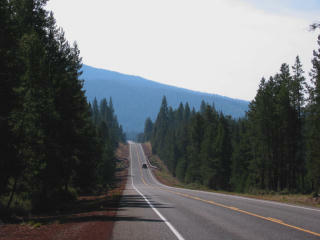 Highway 20 begins as a four-line road with a wide bike lane, but narrows to two lanes with a narrow shoulder later. There are no major climbs, just rolling farmland. Cars were a lot less friendly here, and once I had to escape into the ditch when a car came at me fast on the shoulder. (I always check my rear-view mirror frequently.) Several thunderstorms raced past me rapidly, but it stayed dry, and the heat just wouldn't let up. Clouds were always tantalizingly close, but never hid my sun. When I finally arrived in Sisters, a small pleasant tourist town with a supermarket and restaurants, the rain finally arrived but I found a roof to wait it out. The Cold Springs Campground to which I had been directed in Bend is about 10km west on Highway 242, a narrow quiet country road. Unfortunately it turned out that it had nothing to do with the campground I wanted to go to, so I was stranded in a beautiful wooded and absolutely quiet site, with large spaces for everyone, but only pit toilets and a water pump and no showers. But the scenic grounds almost made up for this. The rain never reached the campground. The next morning, my friendly neighbors at the next site invited me to a breakfast with waffles and melon. They came from Pasadena and had traveled the world widely, and we had lots to talk about. 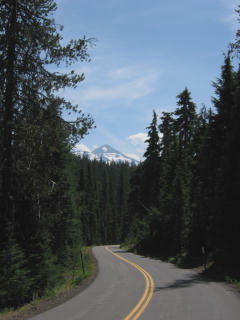 Highway 242 is the nicest way to cross the Cascade Mountains. It's a long climb that gains almost 650 meters, but it's basically a long constant grade without power-wasting dips. There are lots of beautiful views. From the summit, there are stunning views of the sorrounding Cascade mountain peaks. 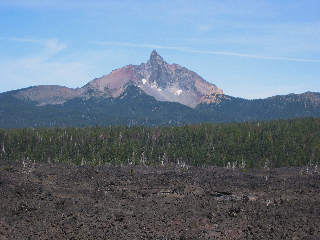 The summit is in the middle of a huge lava field that looks like a huge black lifeless moonscape, like at the front of the picture to the left. There is a view tower built from lava. I met another rider from Idaho here (hi, Brandon) and we rode together for a while. At the summit, we met two white-haired gentlemen on high bikes, the kind with a huge front wheel with directly attached pedals, and a tiny wheel at the back, built in the 1880s (with new saddles, rims, and tires of course). We at first marveled how one could climb to the Cascades summit on one of these, but it turns out that they have come all the way from New Jersey on them! Simply amazing. Check out their website . The downhill was exhilarating. There are too many switchbacks and gravel on the road to go real fast, but it's very scenic for a long time until Highway 242 merges with 126. The picture to the right shows a typical view. At that point traffic picks up a lot, but it's still a nice ride. We had dinner in Vida, a small town 35km before Eugene. Unfortunately it was getting late and we felt we couldn't reach Eugene before dark, and 126 at night is definitely life-threatening. So we followed the advice we got at the restaurant, and left the town on 126 until a large white covered bridge on the left, which we used to cross to the other side. We stayed on the road for about 6km and stayed at the Wayfarer hotel, a large landscaped garden with cabins ($100) and access to the river for swimming. Great place. We continued on to Springfield and Eugene the next morning. They are basically twin cities joined at the hip. Very ugly ducklings, both of them, and they'll never be swans, sorry. The ride begins nice, through large scenic forests, but the last 20km into Springfield are really ugly unless you are looking for auto parts, welding supplies, mini pet marts, or other junk like that and lots of traffic. There is a Safeway supermarket and a bike store though. The first 20km out of Eugene are also unattractive. And forget what I said earlier about courteous Oregon drivers - from now on a large faction of the usual homicidal morons joins them. Once out of the fringes of Eugene, the coastal mountain range is nice enough, especially in the afternoon when the traffic subsides. The climbing is not worth mentioning after a week in the Cascades, just some 150 meters. Unfortunately I lost my riding partner in Springfioeld and spent too much time backtracking, so I didn't make it to the Honeyman state park I had been looking forward to. Those roads are unlit and unridable after dark. So I found an RV campground at the end of Mapleton, which had two nice campsites down at the river. This is the only campground with showers between Eugene and the coast, and there are no motels at all. The next morning I continued riding to Florence, where Highway 126 meets 101 and the Pacific coast. The semi-headwind I had since Bend, and which I even welcomed because of the heat of 35+ C, was replaced with a strong tailwind that only subsides late in the afternoon. I stopped briefly at Honeyman State Park, and spend some time at the Oregon Dunes Overlook point (it's about 2km through the dunes to the beach, and not really worth the walk past the dunes). The picture below was taken at the base of the Overlook point. After that the road just flew by. There are many beautiful views of the ocean, and a number of smaller and two 120m hills. The temperatures were refreshingly low at about 25 C, but dropped to 16 C when the fog started rolling in in the late afternoon. Quite unlike the earlier days, there are many convenience stores along the way. I mostly ignored Reedsport. The next two towns, North Bend and Coos Bay are quite ugly and I left quickly; on Highway 101 instead of the scenic route suggested by the Bicyling the Pacific Coast guidebook (BTPC) because the scenic route was shrouded in fog by then, and it was getting late and I wanted to reach Bandon. Despite my shortcut I had to climb a hill with three peaks, the highest at 240m, before I could pitch my tent at the hiker/biker site at Bullards State Park. 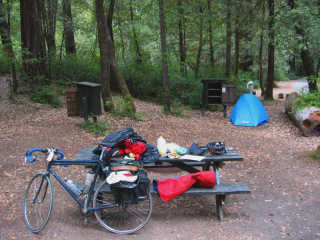 Hiker/biker sites are a unique feature of most campgrounds at the Pacific coast. They are separate sites designed for people who don't need to park a motor vehicle, and usually consist of a number of tables, fire rings, and a little space for tents. Sometimes they are just at the edge of the regular campground, but sometimes they are wonderful secluded sites well away from the usual RV parking lots. I have never heard of anyone turned away from a hiker/biker site even if the campground is full. Hiker/biker campgrounds are a big part of the reason why I keep returning to the Pacific coast. They are usually good for linking up with other cyclists, except on this ride I met very few people, and I was often the only cyclist in the park. Cost is very low too; $4 in Oregon and $3 in California. I decided to have breakfast in Bandon, a small town just south of the campground. It's actually quite nice, if a bit deserted. I had a great sandwich at the deli across from the Continuum, just south of the Masonic Temple. The following stretch of the coast is very scenic, with lots of short climbs that allow gorgeous views over the rocky coastline. 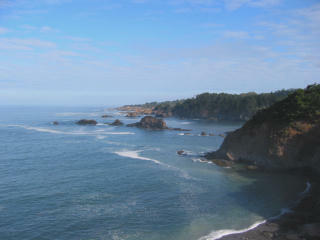 The town of Gold Beach has supermarkets and motels, but is otherwise ignorable. A straight 200m climb up the Cape Sebastian hill follows, and the fog started rolling in on the other side. What I hadn't been prepared for was a seemingly unending sequence of hills to climb after Cape Sebastian, up to 130m and lots of them right up to Harris Beach. It looks easy on the height profile in BTPC, but the book is wrong here. 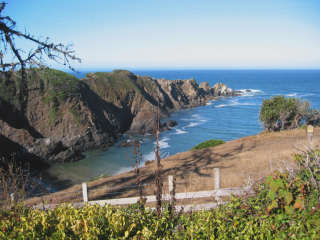 Harris Beach State Park has fabulous hiker/biker sites, secluded from the main campground and with many small groves. Recommended. The day started with fog, just like the previous had ended, and even a little rain. Seems that Oregon and I agree it's time to go our separate ways. The California border is just a few km south of the campground. I was looking forward to having my bags searched for contraband bananas at the border inspection station, but they didn't do checks that day. Just after the station, a quiet but slightly hilly road turns off to the left, crossing 101 after a few km to continue through fields and a small town towards Crescent City. Great way of escaping the traffic for a while. Crescent City is another one of those dreadful towns that are best passed quickly. Then the first of today's two hills starts - an almost straight climb to about 300m, then some more dips and climbs, and finally a long and fast downhill to the town of Klamath, which has restaurants and a market. The BTPC book claims that the summit of the hill after Klamath is at 270m, but in fact it's at 450m and there are two, not one, 50m dips along the way. This added up to over 1200m of climbing that day, and except for the tops of the hills it was all foggy. And no tailwind either. I stayed at the Patrick's Point State Park, which has nice hiker/biker sites in a large forest with some reconstructed Indian huts. It was pitch black when I walked along the narrow trail through the forest to the showers. Just a few hundred years ago people would never have dared to do this for fear of predators that hunt at night, but now of course we have killed them all off so we can walk safely to the showers. The joys of civilization. Sometime during the night it started raining. My tent stayed dry, but in the morning I eventually moved to a nearby hut to repack my bags in watertight plastic and my Ortlieb bag. (If there had been an Ortlieb bag on the Titanic I bet its contents would still be perfectly dry today; these things are amazing.) After four hours of waiting, a ranger told me it was raining all the way from Eureka to Oregon, I gave up and rode south anyway. There isn't a lot to see anyway, and I needed all my concentration to ride safely on this busy stretch of 101. I got two flats from glass shards that are just impossible to see in water. I got a nice tourist map of the Avenue of the Giants in Eureka. The 101 section of Eureka is nasty as usual, but Eureka also has beautiful neighborhoods with Victorian mansions. I didn't sightsee this time; I had seen them on an earlier trip down the coast when it hadn't been raining. Some distance after Eureka the rain turned into a drizzle, and stopped entirely when I reached the Avenue of the Giants 50km south of Eureka. 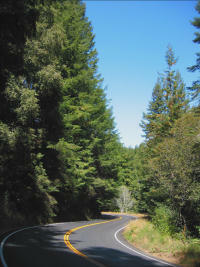 This is a quiet 50km stretch of road that parallels 101 at some distance, and is named after the giant redwood trees it winds its way through. The views are breathtaking; this was definitely a highlight of this tour. Of course they have all sorts of cheesy "tourist attractions" like a drive-through tree and tons of stomach-churning "heirloom art" made from redwood, apparently often with a chainsaw. It's easy to ignore, just look at the trees and try some of the many nature trails. Most are short but memorable. More rain was forecast so I didn't stay at the Marin Garden hiker/biker campsite as I had intended, but rented a cabin in Redcrest for $105. Rather nice place with two rooms and a kitchen, if a bit cute. It even had a rocking chair. I got all my stuff dried there. There is a restaurant that closes early, and a grocery store in Redcrest. The next time was moderately sunny and warm, and I completed the Avenue of the Giants. By now I was way ahead of schedule so I started riding shorter distances. I made lots of side trips, like the Founder's Grove and other nature trails. Another nice one is at the Richardson's Grove park, after rejoining 101. On the theory that you can never have too much information, I asked the ranger at the park entrance about the distance to the Standish-Hickey park, one of my favorites and my destination for the day, and she replied, fifteen miles but it's closed for repaving. Beg your pardon? So I registered right there. Richardson Grove State Park is a quite nice park with a small hiker/biker site, shown on the right picture above. A short walk took me to the South Fork Eel River, which 101 had been following for some time. It's great for swimming. I don't swim much and dislike chlorinated pools, but the river in the middle of the forested hills was too good to resist. It's only 25 kilometers to Leggett from Russian Gulch, and the last 25km I'll see of Highway 101. It's scenic, narrow, has nice views of the Eel river, no shoulder, goes mostly uphill, and has lots of dangerous truck traffic. At Leggett, I had breakfast at the nice market there, and was glad to be finally on highway 1. It's also scenic and narrow, with little shoulder, but has almost no traffic. I first had to climb about 400m over Leggett hill and then 200m over Rockport hill, but these are straight steep climbs with no surprises or power-wasting downhills - climb up one side, descend on the other, done. There are no views. From Rockport hill, I descended from warm and sunny weather right into a fog bank, so when I reached the ocean I could hear and smell but not see it. This went on for a some 10km to Westport, a small town with a small grocery store that makes really nice sandwiches. I always stop here when riding this way. After Westport, the sequence of small hills continues, but the fog let up because the road is either above the fog or too far from the water. There are still many occasional views of the ocean, and it's a really pleasant and scenic ride. I even got a little tailwind. Close to Fort Bragg the traffic gets heavier and more dangerous, but after Fort Bragg there is a nice wide shoulder. There is a Safeway supermarket at the south end of the town. Towns on this ride provided me with chilled orange juice, but otherwise most of them are just blights on nature. Why can't Americans just organically blend their towns into nature, like the Italians and other Europeans can (much of the time)? I guess a millennium or two of practice helps, but here I am just glad when I can leave a town. The day ended at Russian Gulch State Park, which has showers and a hiker/biker site. As was so often the case, the campground was full, but the hiker/biker sites are always available. This one is a little close to one of the restrooms but otherwise quite nice. My neighbor had a dog so I got to listen to a master's lengthy conversattion with her dog: "Molly NO Molly NO Molly NO Molly NO..." If I had a computer with that level of understanding I'd throw it out. Another short day, to avoid reaching San Francisco too early. Just south of the bridge after the campground exit, the Mendocino State Park exit took me through the nice town of Mendocino before it rejoins Highway 1. 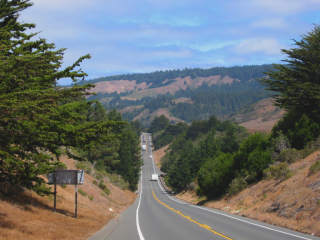 Highway 1 goes through numerous small dips and climbs, over farmland with the hills to the left and the ocean to the right. 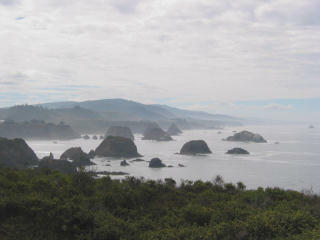 There are many turnouts with beautiful views over the steep cliffs and sand beaches, and the sea stacks in the surf. The weather was mostly sunny, sometimes overcast. Besides Manchester State Beach, which is too close, and Bodega Dunes, which would leave too little for the next day and is too sandy and exposed to the wind anyway, there are no campgrounds with showers along this part of the coast, so I stayed at the Surf Motel in Gualala. There is a supermarket across the street, and Internet access at the north end of town. Highway 1 continues along the coast, over rolling hills with many beautiful views of the rugged coast. The road is narrow but there are few cars. There are lots of steep but short climbs, often so that speed gained on the downhill from one could get me almost, but never quite, to the top of the next. The strong tailwind was back too, and there wasn't a cloud in the sky for the whole day. After about 40km I got to Fort Ross, an early Russian settlement of the West coast, with a wooden wall and several reconstructed wooden building that serve as museums. It seems that unlike later visitors of the area, the Russians got along with the Indians quite well without killing off everyone in sight. Between Fort Ross and Jenner, the terrain becomes more hilly, climbing twice to 170m, with more stunning views of the coast. Jenner has a nice restaurant at the north end of town. 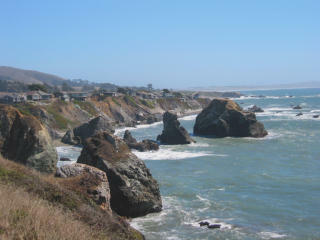 At Bodega Bay, Highway 1 turns inland, and riding becomes markedly harder and less scenic. The road winds its way through parched brown hills with little vegetation, and becomes more and more hilly on the way back to the coast. After Tomales the tailwind had turned into a strong headwind too. When the road returns to the water, one can see the hills of the Tomales Bay State Park on the other side of the inlet. The ride becomes much nicer again close to Marshall. Point Reyes is a small pleasant village with a good grocery store. After Olema, I turned east on Sir Francis Drake Boulevard, and climbed the last hill of the day, 100m. From there it's downhill to a small bridge, where a bike path turns off to the right. The bike path is a quiet and well-paved way right into the Samuel P. Taylor State Park, which has excellent hiker/biker sites. The night was clear and warm, I didn't even need my tent. 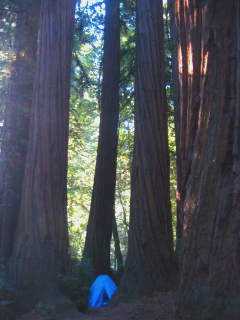 I put it up though; you can see the little blue speck between the giant redwoods in the picture below. The ride continues on Sir Francis Drake Boulevard, which begins narrow and shaded by trees, but soon becomes wider with nice views of the surrounding hills. When entering Fairfax, there are bicycle route signs that lead through quiet residential streets to the right of the busy Sir Francis Drake Boulevard. After returning to SFD, I mostly ignored the complicated route recommended by the BTPC book and took a right at Bon Air, and a left on Magnolia, which later becomes Camino Alto. This route is easy, scenic, and quiet, but it involves a fairly easy 70m climb. After descending, I turned left at the stoplight, and right onto the bike path just before the next stoplight. The bike path runs all the way to Sausalito, past a bicycle store, where the bike path ends. From here it's an easy ride through Sausalito, a rich town climbing up the hill with views of the bay and San Francisco. One of the best ice cream shops in the Bay Area used to be Lappert's, a little past the ferry terminal entry, but now it's just grossly overpriced. There are nice views from the ferry terminal across the Bay. There is a final 70m climb through Sausalito and the hills to the south before reaching the Golden Gate bridge. At its south end, a narrow path leads along the bay shore with good view of the bridge (a large percentage of the Golden Gate postcards are made here; most of the rest is from the Marin Headlands vista point). After following a street through a short loop that leads through the edge of the Presidio park down to the waterfront park, which used to be an army station, it's Bay Street, Columbus, Montgomery, Market, Geary, and Mason Street. I had reserved a room at the Mason Street hostel, where this tour ended. This was my sixth tour involving the US west coast, and likely my last one. In fact I don't see myself visiting the US at all anymore. Under George W. Bush it has turned from the leading western democracy to a predatory proto-police state, waging wars on other countries based on fabricated pretenses, and I am far less ready to excuse its failings. A flawed democracy, highlighted by a federal election in 2000 that would make any third-world banana republic blush; vanishing personal liberties and intelligence services spying into the privacy of its citizens in ways previously known only in communist regimes, even establishing offshore concentration camps where human rights are not recognized. And I can't stand the sight of piles of rags in doorways all over the cities, knowing there are people sleeping under them. I still have hope but not for the near future. I hope you enjoyed reading this report, but at this time I suggest you defer any travel plans there. Good bye, America, it's been nice while it lasted.